The older children attended school in Tales. Classes were held only in the summer months. The children had their difficulties as Norwegian was all they knew. They soon learned English. All our family, but Richard and Stella, attended school at Tales. About 1920, our parents decided we needed a high school education. Dad, Mr. Strand and Theodore Lee opted out of Tales S.D. and section seven became part of Erickson. Our social life was centered around the church, choir and young peoples society. When an occasion arose for a party or social, the families with the larger homes hosted the event. One time, I remember, mom and dad moved the bed out of the downstairs bedroom and the heater out of the front room. Benches and planks were brought in for seating places. Contests, parlour games and sing songs were the entertainment. The young people arrived with sleighs. I guess the teams were all taken care of in the barn. Mother passed away in the winter of 1948, and dad in the summer of 1949. Anna Rasmina was born February 10, 1899. In 1927, she married Gunnar Hall. (refer to Hall, Erik and Elisabet). Sigvald was born in 1900. He died on December 20, 1917, very suddenly from a heart attack. Paul Richard, born May 19, 1902, son of Mr. and Mrs.
to buy for the Manitoba Pool. He became involved in curling which he really enjoyed. In 1932, he married Anne Geekie. They have three sons; John was born in 1934, Barry in 1939, and Terry in 1942. In 1936, the family moved to Erickson where he farmed for a short time. They then moved to Rackham and later to Whitemouth where Paul bought grain for the Canadian Consolidated Grain Company for 16 years. In 1956, they moved to Winnipeg where Paul worked for Robin Hood Flour warehouse. He took his retirement in 1967. 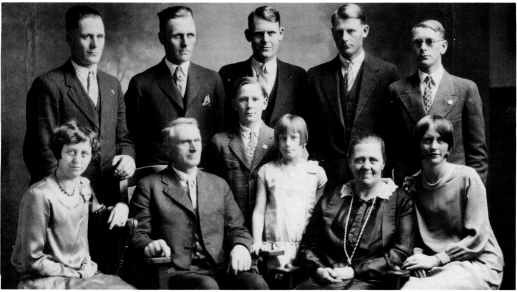 The Peter Paulsen Family. Back Row, Left to Right: Paul, Albin, Rudolph, Ludvig, Harold. Front Row: Anna, Peter, Richard, Stella, Olena and Olga.